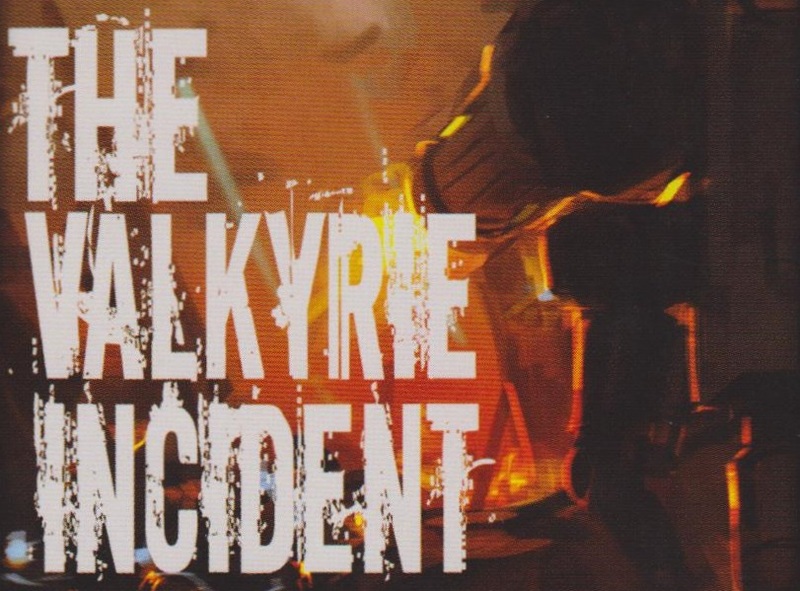 The tension is killing me too, so I’ll say it right now: yeah, I really like The Valkyrie Incident. And yes, the box is very, very small. I had two concerns going in: one, that it would be too similar to my favorite SBG games; and two, that it would stink. As for the first concern, I’m relieved that there’s enough to it that this isn’t Hemloch 2 or Tooth & Nail: Vikings or anything like that. There are definitely points of comparison, but other than some (minor) mechanical similarities, such as competing for control over “territory” cards between two players, The Valkyrie Incident is as distinct as you could hope for. And as for the other concern… well, let’s get the stuff I don’t like about it out of the way first so we can end on a high note. If I had a single piece of advice for Mr Clowdus, it would be that he needs to ship every single one of his games with some sort of reference sheet, because most of his designs have these quirky little phases, like drawing a single card or checking on something that you won’t use in most instances but turn out to be absolutely critical the other one time out of ten. 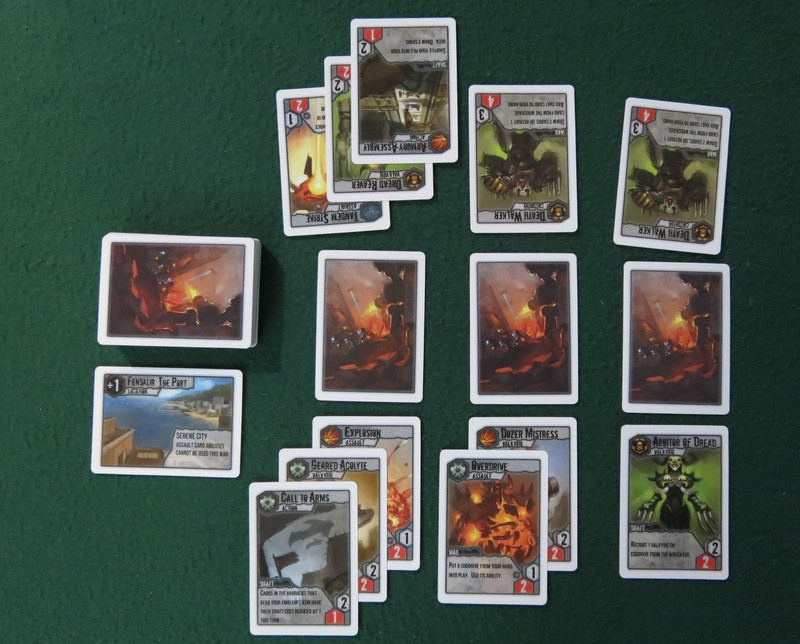 Omen: A Reign of War came with reference cards because each turn consisted of six involved phases that had to be followed strictly or the game would fall apart. Tooth & Nail: Factions even had a nice little synopsis of the rules printed right on the front of the action cards that governed what you could do (and I assure you, it feels downright strange for me to be talking about something I liked from that game). Even from this latest trio of Kickstarter’d games, Shadow of the Sun came with reference cards but Stone & Relic didn’t, which is problematic because it has a whole bunch of possible actions that new players are hard-pressed to keep straight. Once again, The Valkyrie Incident requires everyone to remember every step of every round, necessitating multiple trips back into the manual, which isn’t that strong to begin with (not with lines like “The player who the first second player is the Start player”). Sure, it’s possible to print off fan-made player aids, but I don’t regard that as an optimal solution. Alright, with that out of the way, let’s talk about what I like about the game! 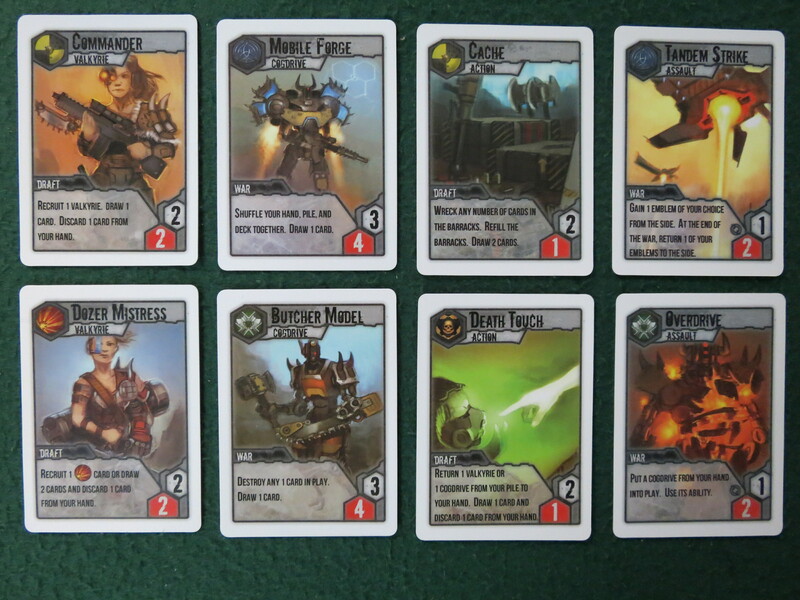 Some of the cards: Valkyries, Cogdrives, Actions, and Assaults. The Valkyrie Incident takes place in such a distant future that men are apparently obsolete and all matters of war are masterfully handled by mechanical cogdrives and female warriors — the eponymous valkyries. This was probably a sweet deal for humanity until the valkyrie clans fell into a great civil war and started up with the orbital bombardments. Now your task is to lead your side to victory over the enemy through the power of battle! Also the power of drafting new recruits! Which may or may not sound quite as exciting as the battle part, but it’s a significant portion of the game — so significant, in fact, that the setup is one long draft phase between you and your opponent until you both have a deck of 15 cards to use in the game proper. Maybe that sounds a bit dull. It did to me too, especially since I don’t usually play drafting games. But there are enough interesting (and good-looking) cards available that after a few minutes I was hiding the good ones behind the others when I passed them to Somerset (my spouse and gaming nemesis) in the hopes she would overlook them. And when you try crap like that, you know a game’s got its hooks into you. There are four types of cards, divided by how good they are in combat and during which phase they come into play. The valkyries themselves are pretty good fighters, and they, along with action cards, have abilities used during the Draft Phase, usually to recruit new troops. Cogdrives and assault cards, on the other hand, are best used later during the War Phase. But we’ll get to that a little later on. Draft Phase: the “Wreckage,” “Incident deck,” and “Barracks” (click for high detail). The game is played over the course of three “encounters,” which is just a glorified name for a “round.” In turn, each encounter consists of two phases. The first is the Draft Phase, during which each player gets a chance to fill up the “barracks” in the middle of the table and use abilities or discarded cards to acquire new toys. In solid SBG fashion, the phase begins with a difficult choice: do you draw five cards, or shuffle your discard pile into your draw pile and draw only four? This is important because even a single card lead by your opponent can spell doom, but your discard won’t ever get rotated back without your help, whether now at the start of the Draft Phase or with the help of a card ability later. Then there’s a brief step where you check for “morale,” which is one of those little steps that necessitates a reference card because it almost never happens. Once that’s done, you can spend the cards in your hand to draft or recruit new cards — and those are different, by the way. Drafting is accomplished by discarding a number of cards equal to the drafted card’s cost, then shuffling it straight into your draw pile; while recruiting is done with the help of card actions, and sends your new card to the discard pile, thus using fewer cards but setting it just that little bit extra out of reach. Both are important, as many of your victory points at the end of the game will come from your choices of which cards to pull into your deck, and it determines the cards you’ll be using in coming rounds. The War Phase is much more exciting. This phase is the most reminiscent of SBG’s previous area control games. There are three central “conflicts” to fight over, and after both sides have drawn some extra cards, the first player gets to choose which location the fighting is over. So you might look at your hand and see you don’t have a surplus of tough cogdrives at this time — so to the sandy dunes of Vingolf it is, and a -2 to all cogdrives’ strength values. Or you might see that you’re stocked up on action cards that would have been nice during the Draft Phase but now they’re kind of worthless, so you choose to storm the fortress of Glitnir, where trickery and space-lasers are much better options than a frontal assault. Then the players take turns until someone passes (at which point the other gal gets one more turn) or they run out of cards. There are plenty of options: anything can be laid down for its combat value, or you can activate your clan’s unique ability, or cogdrives can plop down powerful support abilities before retreating to recharge, or you can permanently get rid of those powerful assault cards to absolutely wreck your enemy’s plans. After three full encounters and an extra massive final battle, whoever is holding onto the most victory points wins. You get points for having cards of your clan type, cards in general, and both conflict and location cards from battles. Then one player gets to do fist-pumps while the other places their head on the table and cowers in shame. At least that’s how we do it at my house. You’ll fight across many locations. Well, five. Five locations. There’s a lot to like here. It may not contain quite the same level of decision-making goodness that’s present in some of John Clowdus’s other designs, but most of the cards do provide alternative — and often unexpected — values. It’s also probably the fastest game from SBG I’ve played, it’s easy to get going in just a few minutes, and other than the shaky rulebook, everything is clear from the get-go. So my final score is that The Valkyrie Incident is definitely worthy of being placed alongside Hemloch and Omen: A Reign of War as one of my favorite Small Box Games yet. 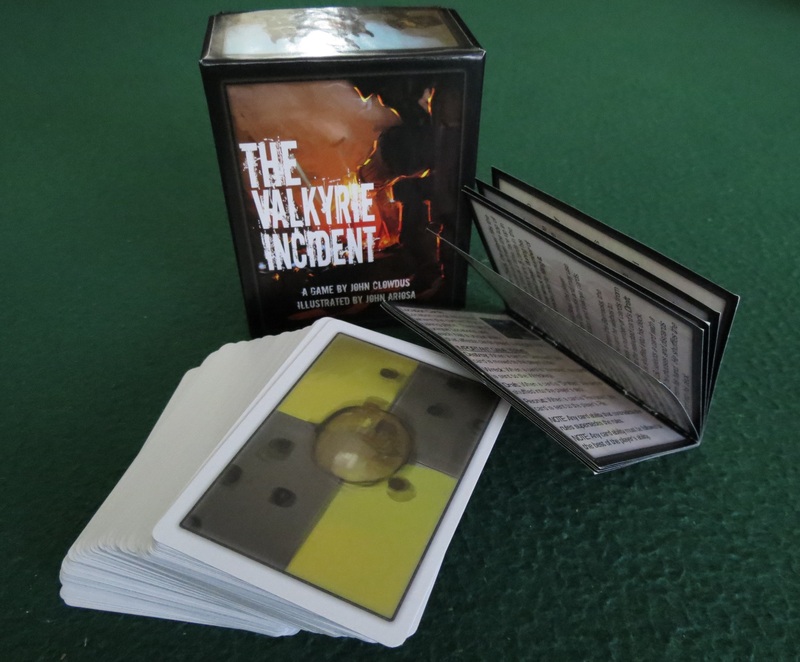 Posted on March 25, 2013, in Board Game and tagged Board Games, Small Box Games, The Board Game Box Review, The Fruits of Kickstarter, The Valkyrie Incident. Bookmark the permalink. 8 Comments. Yes, John is a great guy, and I’m always eager to see what innovations he has up his sleeve (or to be sleeved). Thanks for the write-up! Wonderful job, as usual. Spot on with this review! I personally don’t enjoy TVI quite as much as Stone & Relic because I think the drafting slows the game down considerably, but I like it nonetheless. Pingback: Red Nile: Rise of the First Dynasty | SPACE-BIFF!